After yesterday’s tour with the masses, I found myself thankful we didn’t go to the Hermitage. I recognize it is St. Petersburg #1 attraction, but I heard it was worse than the palace we visited in terms of mobs of people and it was difficult to even enjoy the art. Perhaps I will have to return in the off-season and suffer through the cold to enjoy a few of the attractions peacefully along with the ballet that we had to forego in order to go to the evening reception at Catherine’s Palace last night. Those that know me are probably saying, “yeah, right…she doesn’t even like Denver’s winter.” Yep, I may not ever make it back, especially with all the other places to see in the world, but who knows. At least I got a taste of tourism in Russia. Today, we hoped to mix in with the locals a bit, but that was a little hard given we were following our guide who was holding a giant flower! 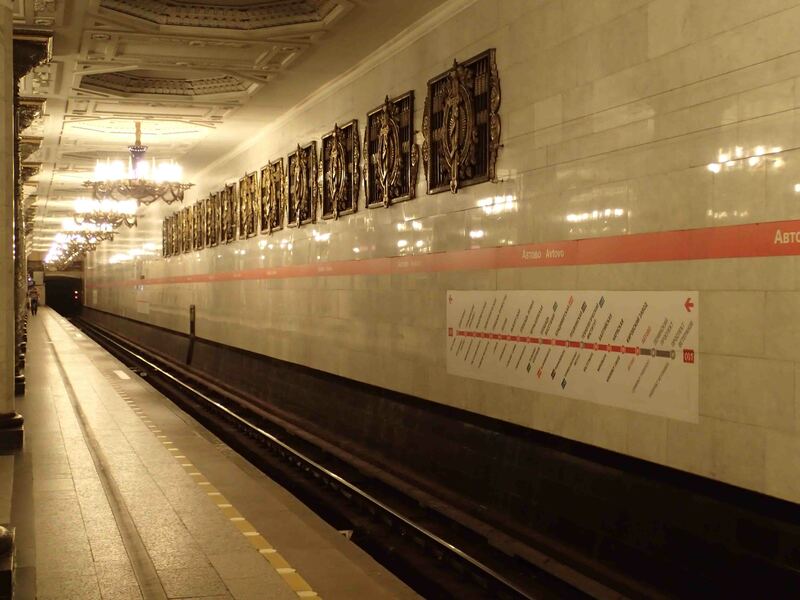 We entered the metro at the Avtovo Station on the redline, the oldest in St. Petersburg and built in 1955. Our guide gave us each a token. She warned us to push it in the slot with a little “umph” or it would return in the slot below. Erin didn’t give the token enough “umph” and sounded the alarm…tourists! We walked down below to see marble columns, crystal, chandeliers, and a mosaic, but I guess after seeing those palaces and church yesterday, the station didn’t seem terribly elaborate. Having said that, of course it was much nicer and cleaner than those in the States. We took the metro six stops while snapping a few other photos along the way. During our ride, one of the ladies in our group turned to our guide and asked, “Excuse me, when are we going to see the stations with the chandeliers?” “It was the first one,” our guide responded. Our fellow tourmate turned to me and said, “The ones in Moscow are much nicer.” Good to know, in case I make it there someday. Anyway, after 6 stops, we exited at the Vladimirskaya station which was very deep underground. The closer the metro gets to the river, the deeper it goes. One station is 120 meters underground. We took a short walk from the metro to the market. I liked the natural honey and cheese counters the best…definitely fresh. The vegetable and meat sections were also nice. They were just typical of any market in the modern world. Next we loaded on the bus for a long drive to a business center for our vodka tasting. It seemed to me they could have found a closer place, but perhaps they needed to extend the tour to four hours or give others a chance to see some of the famous sites. We passed by many of them and included a few new ones, the most notable to me being the site of the old stock exchange and the site of Peter the Great’s original residence, a log cabin. It was built in three days by Swedish carpenters. He lived there while he was planning the city. It is now a museum and protected from all the elements by a brick building. Our vodka tasting was interesting. The restaurant/brewery was modern and bright. It could be found below Microsoft’s office in a business complex. We tried three flavored vodkas…horseradish, pepper and cranberry. They were very strongly infused with distinct tastes. They were served with Russian cuisine of herring, pretzels, and Melba toast soaked in garlic butter so that is was soft like regular toast. Whoever finished the shots first got a free beer, so Suman did the honors. She slammed all three before some tables even got the instructions. The restaurant was so surprised that they didn’t know what to do. They weren’t expecting such a feat, but they honored their promise, and she selected a premium beer. I guess when I was there in cold Oct 2001, things were much different. Food markets did not exist and people stood in lines to buy bread. I thought the orthodox churches were interesting because everyone stands up. There were very few tourist so the Hermitage was a breeze. I highly recommend a book on Peter the Great. One of my favorite books ever. I went to Russia alone… I could not persuade your mother to go with me and most of my friends worked. I’m sorry you missed the ballet.